The H. K. Porter Company was one of this country's most well known locomotive manufacturers. It was the third largest producer, in terms of number of locomotives built, and was the leading producer of what Porter called 'Light Locomotives'. These were engines built specifically for industrial applications, mining, logging, plantations, or lightly built narrow gauge railroads. They helped to build the West, and are found in every country from Argentina to Zanzibar. Alaska Live Steamers Here's a place to learn about the technology and history of American railroading. Included on the grounds is a Porter diesel, over a half mile of track, several types of bridges, a tunnel, steam and other diesel locomotives, and rolling stock. Visitors gain an appreciation for the contributions made by trades and professions who contributed to Ameirca's Industrial Revolution. The skills of civil and mechanical engineers, pattern makers, foundry workers, machinists, boiler makers, sheet metal workers, and carpenters are all represented in the facilities and equipment. Arizona Mining and Mineral Museum The photo is from the Arizona Copper Co. (Coronado RR) Engine #2. See recent photo below of Lawrence Hargis with same engine. 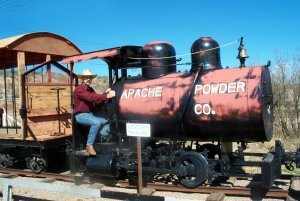 Arizona Railroad Attractions Includes information about the Sharlot Hall Historical Museum in Prescott AZ which has a 1887 H.K. Porter locomotive on the grounds. Arizona Railroad Museum Their homepage listing address, hours, etc. The Central Pacific Railroad Photographic History Museum Some great old photos and good information about the building of the Transcontinental RR. The Colorado RR Museum Established to preserve a tangible record of Colorado's flamboyant railroad era, particularly the state's pioneering narrow gauge mountain railroads. The CPRR Links to Related Railroad, Photography & History Websites Lots More Links! Don's Rail Photos Lots of photos of steam locomotives, several Porters. Slow loading. The Durango and Silverton Narrow Gauge RR One of the most challenging railroad projects ever undertaken (ranking with the Central Pacific Railroad's daunting effort through the Sierra Nevadas). The entire line was designated a National Historic Civil Engineering Landmark in 1968. "Engine No. 1" The first steam locomotive in Canada's Yukon Territory and Fairbanks, has been derailed from destruction by a group, Friends of the Tanana Valley Railroad. This brigade of train lovers formed to save the tank engine built in 1899 by the Porter Locomotive Works in Pittsburgh, Pa. Welded together by their love of history, machines, choo-choos and Alaska, the all-volunteer force has taken the 7-ton workhorse out of retirement. "Eureka Mill RR Porter No. 1" The Eureka Mill RR was a 30" narrow gauge line located in Nevada. It ran for a little over a mile transporting silver ore from the Virginia & Truckee RR at Santiago to the Eureka Mill. Florida Gulf Coast Railroad Museum Includes photo of the Bedt 12, Porter 0-6-0T. This steam locomotive was built for the Brooklyn Navy Yard in 1916. Georgetown Divide gos Loco! Civic leaders work to bring railroad, locomotive to area, including a 1911 Porter. Article from the Mountain Democrat, Placerville California. A Glossary of Railroad Language Learn all about "chip pies" and "possum bellies." "Hilda" A Porter logging locomotive located in New Zealand. History of the Coronado Railroad The first narrow gauge railroad in Arizona, and owners of ten Porters. Nice webpage with photos. Note that their first engine is labeled CorAnadA even though it was for the CorOnadA Railroad. The Iron Trail to Fierro Very little is left today at Fierro, New Mexico to indicate this area once was the thriving center of New Mexico's iron-mining industry. Read about the history of this area, and about the people and events that shaped this mining district near Silver City, New Mexico. The "Joe Douglass" The Joe Douglass is a rare artifact from the silver age of Nevada's mining and railroad history. Built by the H. K. Porter & Co. of Pittsburgh, Pa, this 0-4-2T type engine, with four drive wheels and two small wheels behind supporting an attached water tank and wood bunker, was completed on June 12, 1882, and raised its first steam in Dayton, Ohio. Jokioinen Museum Railway The original motive power of the Jokioinen Railway in Finland was two American tank steam locomotives (Nos. 1 and 2) which were built in 1897 by H. K. Porter in Pittsburgh Pennsylvania. These locomotives were in operation for over 50 years until 1948. The Liverpool & Milton Railway The line�s only steam locomotive was a 0-4-2 tank engine with and overall passenger cab named "Mersey." This steam locomotive, built by the Porter Company (serial #1712) of Pittsburgh Pennsylvania, went new to the line in December 1896. Mersey hauled an average of 40 tons of freight (lumber, pulpwood and pulp) and 150 passengers on its four daily trips over the five mile route. Massachusettes Steam Locomotives Some nice photos. Several Porters. Mt. Ranier Scenic Railroad Located in Elbe Washington, they offer steam train excursions, including Porters, through the foothills of Mt. Rainier. A nice picture of the Porter 2-8-2 #5 crossing the Nisqually River trestle. Click on photo to the right to see their photo gallery. The Narrow Gauge Circle All about Narrow Gauge travel in days past in Colorado. Lots of great photos, too. NilesCanyon Railway The Niles Canyon Railway ("NCRY") is dedicated to the restoration and preservation of the history of the small unusual "railroad" operations of the Pacific Coast. Steam once again returned to the Niles Canyon on December 3, 1989 when locomotive #3, an "0-4-0" built by Porter in 1911, wafted its wood burning scent skyward carrying passengers into the Canyon for the first time since the fifties. Northern Pacific's Minnetonka A very nice photo. The Minnetonka (1-3 old series) 0-4-0 switcher. Built by Smith & Porter, 1870. Northern Pacific's first locomotive. Old Dominion Chapter National Railway Historical Society Here there is an 0-4-0 Porter on display at the Museum in Richmond Virginia, and they also own, operate, and maintain another Porter (an 0-6-0 style) at their rail yard near the city.The 0-6-0 is believed to be the only steam engine still "running" in the state of Virginia. Porter and manufacturing capabilities From the 1943 catalogue. The Porter Locomotive Forum This forum is meant for the discussion of topics relating to locomotives and equipment built by the H.K. Porter Locomotive Works of Pittsburgh, PA. The Porter Locomotive Works Located in Pittsburg, PA, they specialized in a line of locomotives for industrial and logging railroads. Porter Screen Saver Download this Porter Locomotive Screen Saver seen to the right. A slide show of 50 illustrations from the 1892 Light Locomotive Catalog from H.K. Porter & Co.
Porter Switchers Photos of diesel porters from the 1943 catalogue. Porters in Russia! Although this site is in Russian, it has nice photos of Porters that were part of the Porter NG steam locos that were shipped to Russia and the USSR in the late 19th century and during the WWII. The Railroad Gauge The US Standard railroad gauge (distance between the rails) is 4 feet, 8.5 inches. That's an exceedingly odd number. Why was that gauge used? Railroad Museum of Long Island The H.K. Porter 0-4-0T #1 was built by the H.K. Porter Locomotive works in 1921 for the Defiance Coal Company in Mentmore, New Mexico. The RR Museum of Pennslyvania A Roster of steam locomotives. Railroads to the West A listing of links about early railroad transportation to the West. San Diego and Arizona Railway A photo of the smallest of the museum's locomotives, this 25-ton Diesel switcher #8157 was the last standard-gauge Porter delivered to California and its last operating one, and worked only in southern California. Southeastern Railway Museum, Duluth, Georgia Their locomotive was built by the H. K. Porter Company of Pittsburgh, PA in 1943 for the United States Army as #5050--"old half and half," they used to call her. Steam in Mozambique Neat photos of Porters in the tropics. Steam Locomotives of the Genesee & Wyoming RR Lots of nice B&W photos of Porters. The "Sugar Cane Train" also known now as the Lahaina, Kaanapali & Pacific Railroad. On Maui there were many of these narrow-gauge railroads in operation for the sugar cane industry. This one opened in 1969 for tourist purposes, and the engines are replicas of the original ones. Several trains each day operate year round. The "Sunshine Express" A Porter locomotive, passenger cars, and caboose located in Selma, California. The entire train was designed by Lawrence Hargis. T-shirts, mugs, tote bags and other neat Porter items available from RailwayStation.com. Two for the Railroad A great postcard showing a Porter steam locomotive and a Porter diesel next to each other on the Alaska Railroad. The Yosemite Shortline features five Porter locomotives. Jan/Feb issue of the "Narrow Gauge & Shortline Gazette"
on "Fireless Locomotives of the Apache Powder Company." *Lawrence Hargis is a 737 Captain for Southwest Airlines and a graduate of the Air Force Academy with a degree in Military History. He also works part time designing large scale riding trains for amusement parks. See this Porter locomotive, passenger cars and caboose located in Selma, California. In his spare time, he models a Mexican copper mining railroad in G scale. He has been interested in Porters for about fourteen years, and has been using his time on layovers around the country to visit libraries and train museums researching their history. He has written numerous articles for model railroading magazines pertaining to Porter locomotives. Lawrence lives in Palominas, Arizona. He has two daughters, Grace and Gloria, and a donkey named Ni�o. Add your URL to this page!